Who doesn't love breakfast, right?! So when Krusteaz reached out to me and asked if I was interested in working with them, we jumped on it! February is National Hot Breakfast Month - but hot breakfast doesn't have to be a morning staple. In fact a good hot breakfast is one of our favorite dinners. Especially being a Mom, it's something that is easy, quick, filling and is something the entire family enjoys and looks forward too. I honestly don't think we do it enough! 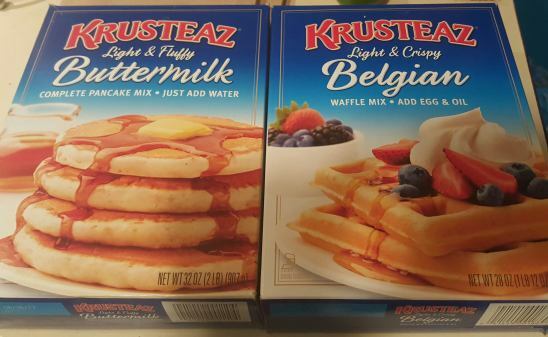 Krusteaz sent us some product to help celebrate National Hot Breakfast Month. Our family is mixed, half of us enjoy pancakes while the other half would rather indulge in some waffles. My grandma is who I think of when making pancakes and waffles. I remember my sister and I staying over for the weekend and she would always be the first one up making pancakes for us. And not just any pancakes, she would always try to design them, make sun shines, write our names out or even just a simple happy face. The little touch, would mean so much and make lasting memories! For the folks at Krusteaz, Breakfast Night is every Wednesday, a night where the whole family can spend quality time together and enjoy a meal that's easy, familiar and delicious. It doesn't have to be fancy, just needs to be fun! In a recent survey, Krusteaz found that nine out of ten Americans say they eat breakfast for dinner, with more then half of respondents enjoying breakfast night dinners once a month or more, and nearly a quarter eating breakfast for dinner once a week. I love the Krusteaz mixes - they have pancakes, waffles and muffins! The pancake mix is great, you simply add water, mix and cook. We like to camp a lot and this is a great product to take with you. It's so easy to take a box, a griddle for a nice hot fresh breakfast. You can even take some fruit such as some strawberries and top your pancakes with fresh fruit to make an even more satisfying meal. Couldn't be any more easier! Visit Krusteaz.com for more information and recipe ideas.